After 2 weeks and 4 bonding sessions, Agatha finally accepted Norman as her new mate. I felt so bad for her, losing 2 previous mates so close together, she just didn't want a new partner. And i didn't have any females for her. And she straight up rejected lil smokey! I was starting to run out of boys for her to pick from. Luckily Norman is a really nice mouse and he was very patient with her. Anyway, I'm pleased to announce that they have bonded! All they do is snuggle now. I wish them a long and happy life. That is wonderful to hear!!! When will we see pictures of the new couple!? They never come out! It's all secret snuggles. Awww, thats wonderful! Im jealous, howd you get your hands on a mouse like Agatha? @scaredymouse wrote: They never come out! It's all secret snuggles. @CinnamonPearl wrote: Awww, thats wonderful! Im jealous, howd you get your hands on a mouse like Agatha? Agatha is an ASF, African Soft Fur rat. They actually look more like a mouse than a rat. They are a bit bigger than mice but not as big as a rat. 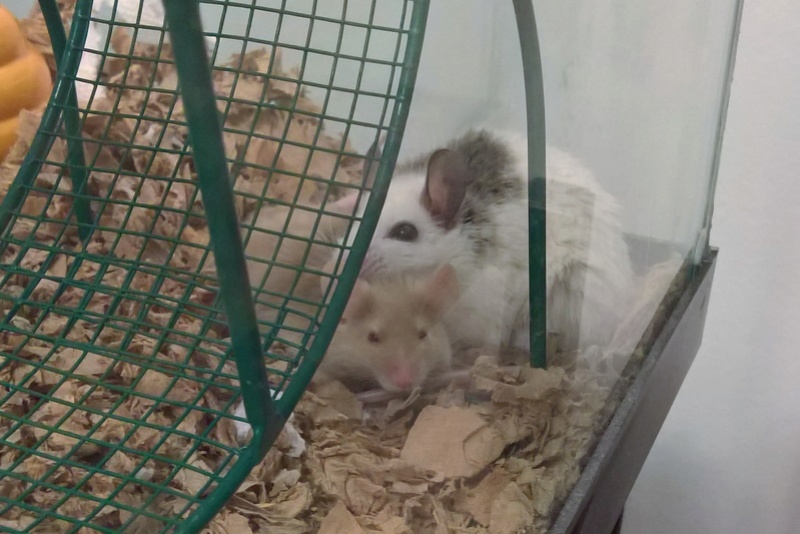 So since they aren't a mouse, you can have a male mouse with a female ASF, because they can't make babies. I had to go to a reptile expo to make contact with a breeder. Then had to drive 2 hours to meet him because he had sold out. After all that, he just gave her to me for free! She's a wild little thing but she lets me pet her. I got her to keep an ocd male company, but he just died of old age, so i had to find her a new friend. 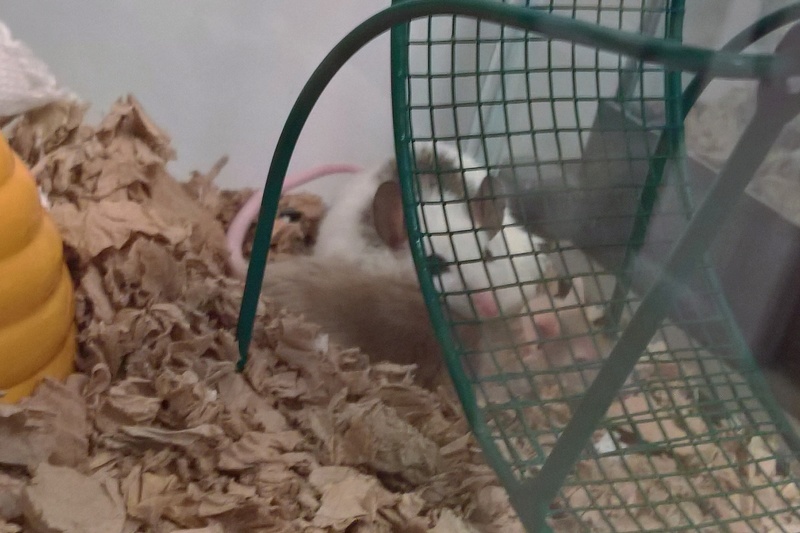 These are terrible pics but this is the first time I've seen them out since they bonded. They love private time! How cute! She looks huge compared to Norman. We found some ASFs at a fish/reptile store at the beginning of the month. They said they're pretty new to the store. It'll be a fun to experience to tackle someday. Gosh, they sure are adorable together!!! Thanks for getting some photos of them!!! Wow, she is so much bigger than him! @Peachy wrote: How cute! She looks huge compared to Norman. Nice! I kind of want one (not that I can get one right now--if at all), but I read different things about them. I think I've read some people say they stink...others say they don't? They're on the aggressive or skittish side? Well, if I'm determined, patient, and gentle, I'd imagine I could tame one somewhat to make it a decent pet. The thing I probably dislike the most is that I read that they're huge chewers...and chew up any plastic thing. What are your thoughts/experience on that, scaredymouse? Thanks for sharing those pictures, by the way; and it's nice that they're getting along! 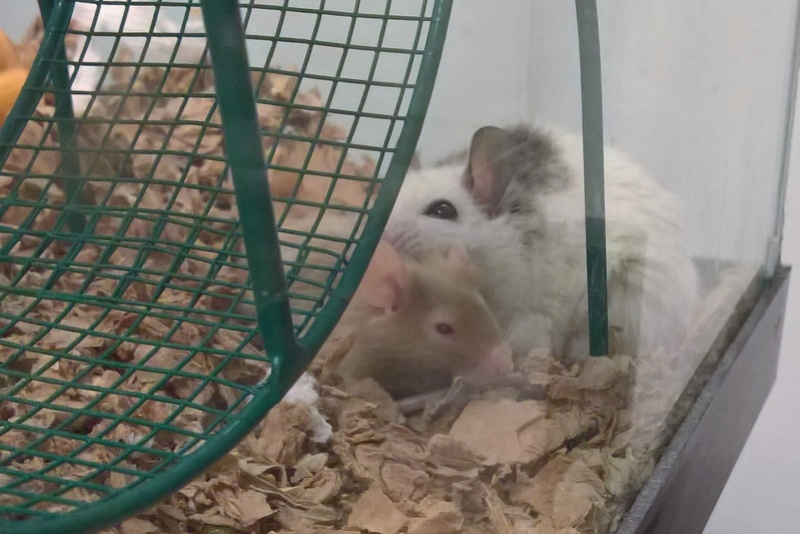 Since it's not advised to put two or more male mice together, to keep them from being lonely if you follow that advice, I always want to suggest giving him a female ASFR. By the way, are they actually rats, or mice? I'm still unsure on that. I've read somewhere that they can get the size of a hamster, I think; I'm assuming they're talking about Syrian hamsters, or no? And I've seen some good-sized ones at a pet store my dad takes me to occasionally, so I think I can tell they get a bit bigger than mice. 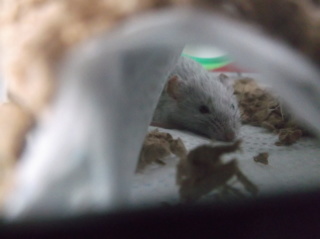 In fact, they might be close to gerbil size.. I'm not sure my mom would let me do this, but when my mice die, and if I can, I might want to get a gerbil and ASF rat and let them live together...hopefully they'd be nice to each other, though. I do really like my current oldest mouse, Daniela. And I'm excited, 'cause I'm close to having her a full year! Just two more months. I haven't seen much of Irene today/night, but I...don't like her. She's probably younger than Dani, too, sadly (no offense).